Nearly every artist under the age of fifty in the United States today has a Master of Fine Arts degree. Howard Singerman's thoughtful study is the first to place that degree in its proper historical framework and ideological context. Arguing that where artists are trained makes a difference in the forms and meanings they produce, he shows how the university, with its disciplined organization of knowledge and demand for language, played a critical role in the production of modernism in the visual arts. Now it is shaping what we call postmodernism: like postmodernist art, the graduate university stresses theory and research over manual skills and traditional techniques of representation. Singerman, who holds an M.F.A. in sculpture as well as a Ph.D. in Visual and Cultural Studies, is interested in the question of the artist as a "professional" and what that word means for and about the fashioning of artists. 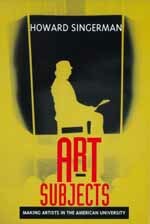 He begins by examining the first campus-based art schools in the 1870s and goes on to consider the structuring role of women art educators and women students; the shift from the "fine arts" to the "visual arts"; the fundamental grammar of art laid down in the schoolroom; and the development of professional art training in the American university. Singerman's book reveals the ways we have conceived of art in the past hundred years and have institutionalized that conception as atelier activity, as craft, and finally as theory and performance. Howard Singerman is Professor of Contemporary Art and Theory at the University of Virginia.